Flitwick Town’s lead at the head of the Premier Division supported by Sportsform table is now up to four points following their 3-2 victory at AFC Kempston Town & Bedford College. It was the College boys who took the lead in the second minute via Tim Clarke but the Town, with a goal from Tom O’Donnell, were level in the 31st minute to see the sides all square at the interval. Within 10 minutes of the restart Justin Newman had headed the home side back into the lead only to see Dan Stafford make it 2-2 in the 68th minute and his side go on to collect all three points via a 87th minute own goal. Now up to second place are Renhold United who ended a three game losing away run by winning 2-1 at Stevington. Travis Joseph and Serge Kadji scored the vital goals against one in reply from Tom Magill. United took over second spot from Caldecote who dropped to third place after being held to a 1-1 home draw by AFC Oakley M&DH. Jordan Platt was on the home scoresheet with Dan Kelly netting for the visitors who now occupy fourth spot. Now in fifth are Wilstead who with goals from Tom Stonehouse and Luke Pursey ran out 2-0 home winners over Sharnbrook. 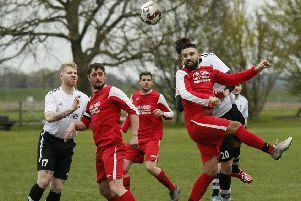 The biggest win of the day belonged to Kempston Rovers Development who ran out 5-1 victors at Ickwell & Old Warden. Evan Beldon with a brace was joined on the scoresheet by Sam Smith, Patrick Asare and Matthew Dingley to bring up the nap hand against a lone home reply from Conor Green. Shefford Town & Campton extended their unbeaten home record with a 4-3 victory over Cranfield United, Jake Renney with a brace plus Jack Brown and Ryan Lewis netting the goals against United replies via James Armstrong twice and David Adderson. At Bedford Road bottom of the table Sandy, with goals from Pete Rogan, Adam Grimshaw and Alex Baker, must have believed they were on their way to their first win of the season when they led Wootton Blue Cross 3-0 at half-time. However Jack Downes netted four times in the second period to give the Blue Cross all three points and their first away win of the season. League leaders Queens Park Crescents needed a 90th minute goal from Fabio Satter to earn them a share of the spoils from a 1-1 home draw against Henlow. The visitors had taken the lead with a goal from Paul Wright just five minutes into the game to extend their unbeaten ways to eight games. Now in fourth spot are M&DH Clapham Sports who ran out 5-1 home winners over Elstow Abbey. Glen Tumulty with a brace being joined on the scoresheet by Liam Bolton, Harry Gray and Jordan McGoldrik to bring up the nap hand against a lone Abbey reply via Dean Leydon. Westoning ended a run of five straight defeats with a 5-4 home win over Meltis Albion. Brian Reynolds, Lewis Cooksley, Thomas Cooksley, James Lovett and Dan Riddaway all found the back of the net against Albion replies via a Tom Hughes hat-trick and a single strike from Carl Townsend. The scheduled Crawley Green Reserves v The 61FC Luton Reserves game was postponed. Into the hat for the semi-final draw are Totternhoe Reserves and Shefford Town & Campton Reserves. The Town were 2-1 home winners over AFC Kempston Town & Bedford College Reserves with second half goals from Ryan Dobson and Michael Bhatti against a lone reply from Dan Church. Totternhoe Reserves won 5-2 at Cople & Bedford SA. Joe Smith with a brace joined on the scoresheet by Callum Burgess, Jack Capehorn and Brayden Judge against home replies from Ollie Hughes and Paul Nigro. AFC Oakley M&DH Reserves kept their last 16 hopes alive with a 2-1 home win over AFC Kempston Town & Bedford Colleage Am Kade Walker and Dan Glos netting the vital goals against a Town reply from David Di Carlo. For runaway Group leaders Riseley Sports it was a 7-1 home victory over Bedford Albion. Sam Harrison with a brace was joined on the scoresheet by goals from Jack Healey, James Cooke, Jamie Simmons and Duncan Campbell against a lone reply via Albion’s Benny Deborah. Whilst second place Atletico Europa were 2-1 winners at Clifton, Mo Banda and Vailant Mudokwaai netting the vital goals against a lone home reply from Andy Harvey. The scheduled Kempston Athletic v Caldecote Reserves game failed to beat the weather. Cranfield United Reserves ensured themselves of a last 16 place with a 4-1 home victory over Dinamo Flitwick. Ryan Collis netted twice alongside single strikes from Antonio Ricciardi and Aiden Medhurst against a lone reply from Alex Sommers. Caldecote A did their chances of joining them in the last 16 no harm at all by winning 6-1 at Stevington Reserves. Ricky Aris led the way with a hat-trick and was joined on the scoresheet by Tony Norman. James Whitmore and Neil Giles against a lone reply from John Devereux. Flitwick Town Reserves are now safely into the last 16 following their 4-0 home win over White Eagles thanks to a brace of goals from Chris Bull plus single strikes from Sean O’Donnell and Andy Dadd. Whilst both Harlington and Marston Shelton Rovers kept their hopes alive of joining them in the last 16 by sharing the points from a 4-4 draw. Cameron Fazel, Shea Gentle-King, Ben Whalley and Ryan Martin were on the home scoresheet against Rovers replies via Kieran Day twice plus Dale Maiciw and Ross Milton. Wilstead Reserves are into the last 16 following their 5-0 victory at Flitwick Town A. Robert Booth scored twice alongside single strikes from Liam Philps, Lewis Duffield and Robert Lilley to bring up the nap hand. Renhold United Reserves kept their hopes alive of joining them with a 5-1 home victory over Houghton Athletic. Michael France with a brace plus single goals from Jesse Bhangle, Thomas O’Neil and Josh Cowley only being replied to once by Ali Mohaydeen for the Athletic. With the Sundon Park Rovers v Wootton Village game postponed due to the weather Henlow Reserves did their chances of reaching the last 16 a power of good with a 3-2 home win over Sandy Albion. James Campbell, Keith Milburn and Robbie Bratchell scored the vital goals against Albion replies from Jack Willis and Liam Brophy. With Lidlington United Sports failing to raise a side to entertain Wixams at Hurst Grove the scheduled visitors were duly gifted the three points and a place in the last 16. Lea Sports PSG will now face a home tie against Mill Lane at the Semi-Final stage of this seasons Hertfordshire FA Junior Cup following their 3-2 home Quarter Final win over Silk FC. Rhys Cadger, Joe Hennem plus a Ryan Darby penalty netting the vital goals.